St. Petersburg, FL. 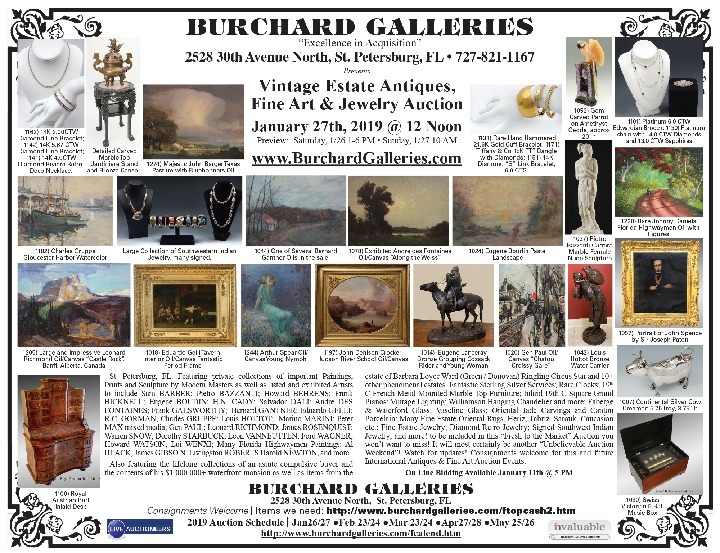 Featuring private collections of important Paintings, Prints and Sculpture by Modern Masters as well as listed and exhibited Artists to include Sam BARBER; Pietro BAZZANTI; Howard BEHRENS; Frank BICKNELL; Eugene BOUDIN; H.N. CADY; Salvador DALI; Andre DES FONTAINES; Frank GALSWORTHY; Bernard GANTNER; Eduardo GELLI; R.C. GORMAN; Charles GRUPPE; Louis HOTTOT; Marino MARINI; Peter MAX mixed media; Gen PAUL; Leonard RICHMOND; James ROSENQUIST; Warren SNOW; Dorothy STARBUCK; Leon VANNEUTTEN; Ford WAGNER; Howard WATSON; Lui WENXI; Many Florida Highwaymen Paintings: Al BLACK, James GIBSO N, Livingston ROBERTS Harold NEWTON, and more..
Also featuring the lifelong collections of an astute compulsive buyer and the contents of his $1,000,000+ waterfront mansion as well as items from the estate of Barbara Loyce Ward (Green / Donovan) Ringling Circus Star and 10+ other phenomenal estates. Fantastic Sterling Silver Services; Rare Clocks; 19th C French Metal Mounted Marble Top Furniture; Inlaid 19th C Square Grand Pianos; Vintage Lighting: Williamson Hanging Chandelier and more; Faberge & Waterford Glass; Vaseline Glass; Oriental Jade Carvings and Canton Porcelain; Many Fine Estate Oriental Rugs, Heriz, Tabriz, Sarouk, Caucasian etc. ; Fine Estate Jewelry; Diamond Retro Jewelry; Signed Southwest Indian Jewelry; and more! to be included in this “Fresh to the Market” Auction you won’t want to miss! It will most certainly be another “Unbelievable Auction Weekend”! Watch for updates! Consignments welcome for this and future. International Antiques & Fine Art Auction Events. 1162) 14K 2.00CTW Diamond Line Bracelet; 1142) 14K 5.67 CTW Diamond Line Bracelet; 1141) 14K 4.0CTW Diamond Riviere Retro- Deco Necklace. Detailed Carved Marble Top Jardiniere Stand and Bronze Censor. 1131) Rare Hand Hammered 21.6K Gold Cuff Bracelet; 1171) Tiffany & Co 18K “T” Bangle with Diamonds; 1151) 14K Diamond “S” Link Bracelet, 6.0 CTS. Large Collection of Southwestern Indian Jewelry, many signed. 1044) One of Several Bernard Gantner Oils in the sale. 1065) French Steel and Wrought Iron Foyer Hall Rack and Umbrella Stand. 1008) Lacquered Chinoiserie Decorated Drop Front Desk. Great fitted interior!